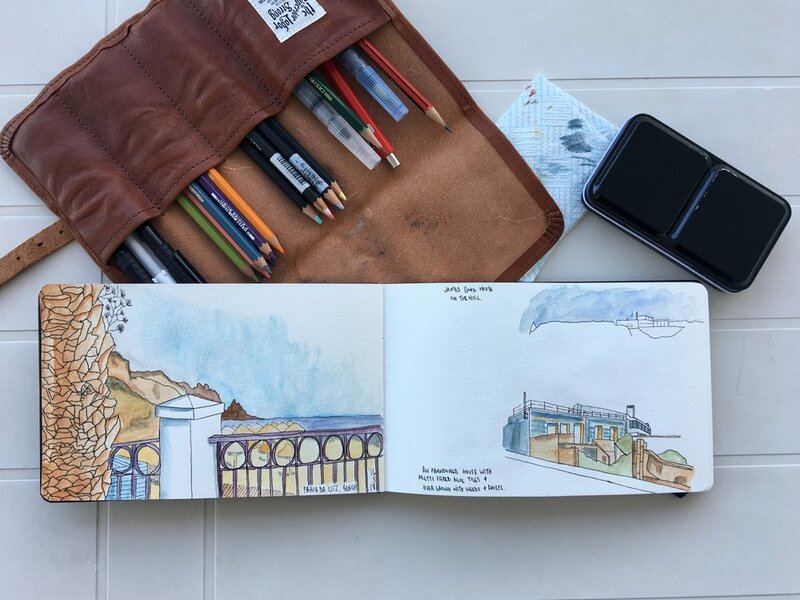 A holiday is the perfect opportunity for sketching. Pretty scenery, plenty of time on your hands, (despite small people) and good intentions. I have never been that great at sketching while on holiday. I’m conscious of people I am traveling with and wasting their time, plus there is the issue of confidence. However on a recent trip I decided to really try and dedicate some time to sketching elements of my holiday. For this trip I have been using a Moleskine Watercolour sketchbook. I really like the hard back cover of this notebook and the size works really well too. In addition to coloured pencils and my watercolour palette I brought along my aquwash brush pens, a few Faber-Castell PITT Artist pens and some graphite pencils. These are all thrown in my Superior Labor pen roll. Alongside these main tools I have a brass bullet sharpener, a Faber-Castell eraser and a penco big clip. 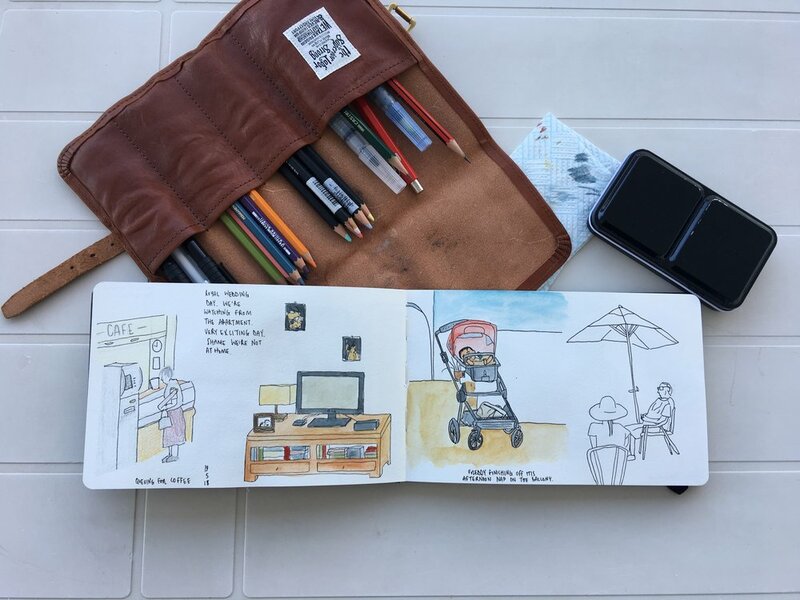 For the first time, I have carved out moments during my holiday to pull out my sketchbook and draw. I have been putting the base down in pencil and then inking and painting later on. The idea was the capture as much as I could with pencil and give myself a base to then spend time on later in the day adding the colour. I’ve used my watercolours a lot during this trip. The Pentel Aquwash brushpens have really made it easy to paint and not worry too much about my tools although my painting still leaves a lot to be desired. I have struggled with using my coloured pencils with the Moleskine paper. The texture of the paper means you don’t get complete coverage on the page which has been a little frustrating and has meant I haven’t used them too much. I think coloured pencils could be my thing so I will try a different sketchbook and really test out this medium. I’ve managed to sketch something everyday which I’m really pleased about. It’s made me look at a place I visit each year in more detail than I think I have before. Sketching exactly when I wanted to wasn’t always possible therefore I took photos to work from when I had time. It was less about capturing exactly what I saw, more about finding a way to reflect and remember things from our holiday. Inking before adding any watercolour. I’ve really enjoyed sketching on this trip. I honestly didn’t think I would do as much as I have, I’ve almost completed half a sketch book. I have found it a little tiring at times with evenings spent inking and painting but overall it’s been great fun. I have caught the sketching bug and plan to sketch regularly and not just be lured in by the exotic holiday scenery, but sketch the local, everyday things I see and pass. Oh and here’s me sketching the view.